Passionate--formerly Moderate--now Liberal "Mormon": KBYU Radio 1955 - My Mother Was a DJ?! 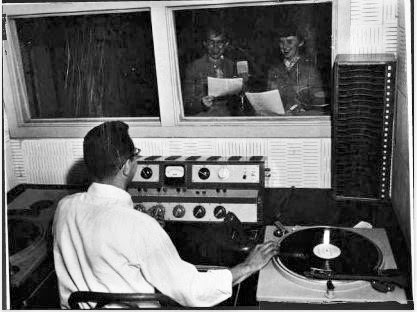 KBYU Radio 1955 - My Mother Was a DJ?! I had no idea! When asked, my mom explained that she had been on a program called, "A Coed's View of BYU." In her personal history materials, I also found two hand-written scripts of radio programs. Whether actually presented or not, I cannot tell. They seem real enough. Hi, girls and fellows of B.Y.U. This is June Peterson all set to bring you more talk and records on this, our regular Monday evening show. wonder what it can do for tests? Hi, to the music of “Blue Violins” we are once more bringing you a “Coed's View of BYU.” This is the program for and about the girls here on campus, what they are doing, wearing, saying and thinking. I'm June Peterson and besides all this information we have for you, we have some records we hope you'll enjoy. There isn't much question about what B.Y.U.ers will be wearing this Wednesday. If the day is bright and sunny, sports tops will be in order as students climb to the Y to restore it to glory. In the event that Mother Nature refuses to cooperate again, the guys and gals will be dressed in rain coats as they down-heartedly trudge to classes. You know, with the funny spring we've had, it's hard to realize that the school year is almost over. But when such activities as Y day and spring formals are in order, there is no denying that the time is really going by. The school year being almost over seems to make everyone think just a little more about home and the people who are there. And whether you do your own cooking or eat at one of the cafeterias here on campus, I'd be willing to bet that every once in awhile you really miss that home cooking. Yes, it's pretty nice to have a home to go to and a family that always seems glad to see you. However, these families didn't always seem as nice as they do now. When I was little, there was a song I used to sing. My mother really took me seriously, and before I knew it, I had five brothers. This was the song that I owe it all to. We usually have our difficulties with brothers and sisters, but there are two people in every family who are really tops. These people are Mother and Dad. But rumor has it that even these people have minor difficulties occasionally. This is the way that story goes. All kidding aside though, don't most of you think that a home is one good place to be? School's fun and all that, but sometimes don't you feel just a little bit homesick? Sometimes it seems like you just have to go home. There is one pretty special place for most people here at the Y. It may be in California, New York, England or France. It doesn't matter what the countryside looks like, the feeling is still the same. What is this place? Well, it's called the same thing no matter where it is or who is talking about it. It's my Street. You may be wondering what brought on all this sudden rush of sentiment. Well, if you'll take a look at your calendar and find out what next Sunday will be, I think you'll understand. Sometimes we don't appreciate our parents as much as we should, but this is one time of year when we all wish hearts could talk and say the things we really mean. Further evidence for actual broadcast was a sheet I found in my Mom's handwriting with songs listed for one of the programs (in parentheses in the scripts). Some were checked and others crossed out. This was written on the back of a mimeographed sheet for song approvals at KBYU Radio. I searched BYU Archives and found no trace of my mom at KBYU. The documentary history of KBYU is rather sparse. I donated the documents I had that now reside in the L. Tom Perrry Special Collections at the BYU Library. My Mom is now part of BYU History! She didn't graduate with a college degree. Once she accepted my Dad's proposal to marry him, her parents did not see the need to send her back to school for Spring 1956. My Mom and Dad were married that next August and I was born ten months after that, just weeks after my Dad's graduation from the Y. My Mom always participated in church speech and stage productions. She was a "Singing Mother" raising three pretty good kids. Later in life, she took on causes to meet needs she felt deeply. When her father came down with cancer, she volunteered and raised money for the American Cancer Society. When her mother began to lose her eyesight, my Mom volunteered to read books at the studio of Recordings for the Blind. No doubt she relied on elocution skills learned at KBYU. 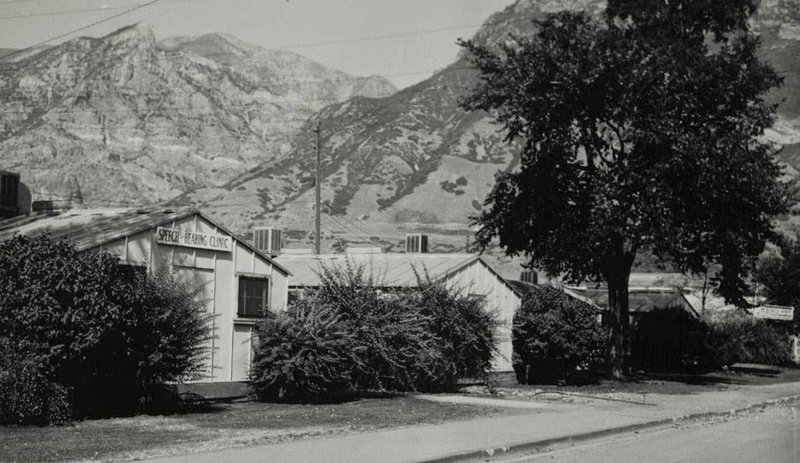 KBYU Facilities pre-Wilkinson Center (same site as). WWII Era Buildings. Note KBYU Radio Sign at far right. Uncle John in Union Blue? My Mom Just Made My Day!